BRADFORD - The U.S. Claims Court has awarded more than $4.5 million in compensation to a Bradford couple for damage caused to their 3½-year-old son by regular vaccinations. 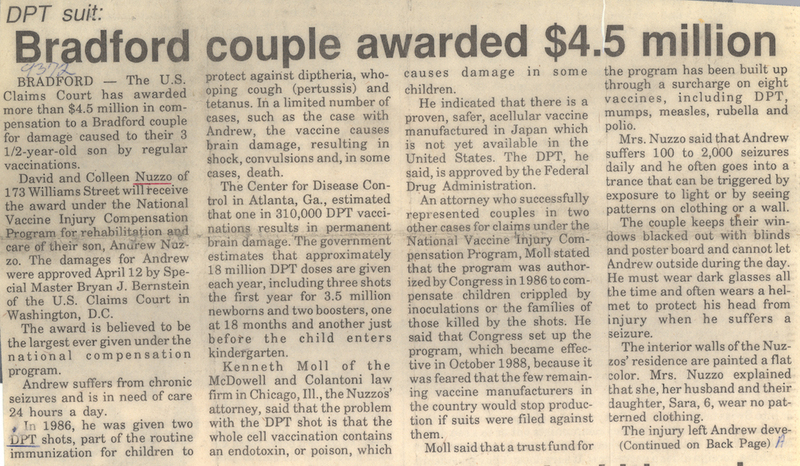 In 1986, he was given two DPT shots, part of the routine immunization for children to protect against diphtheria, whooping cough (pertussis) and tetanus. In a limited number of cases, such as the case with Andrew, the vaccine causes brain damage, resulting in shock, convulsions and, in some cases, death. Kenneth Moll of the McDowell and Colantoni law firm in Chicago, Ill., the Nuzzos' attorney, said that the problem with the DPT shot is that the whole cell vaccination contains an endotoxin, or poison, which causes damage in some children. The award was based on estimates that Andrew's medical and non-medical expenses will cost approximately $67,000 a year as a child and some $102,000 a year as an adult. Although chances are slim of Andrew recovering from the vaccinations, the Nuzzos welcome the money they will receive for therapy and any other help they can give their son.